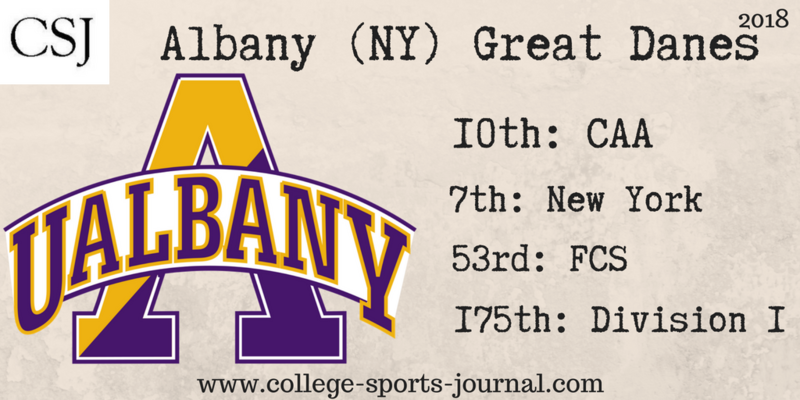 2017 In a Sentence: Albany lost its star running back, RB Elijah Ibitokun-Hanks, and while freshman RB Karl Mofor did an admirable job filling in, the loss of Ibitoukn-Hanks was too much to overcome as the Great Danes slogged through a 4-7 season. Biggest Shoes to Fill: LB Nate Hatalsky commanded the middle of the field to the tune of 122 total tackles in 2017 helping to hold opposing runners to 3.0 yards per carry. Albany will need to fill his spot early in the season to have any shot at competing in the tough CAA. Key Player: Will junior RB Elijah Ibitokun-Hanks be the game guy he was before he got injured? To have a shot to stay close in CAA competition, Ibitokun-Hanks has to be the player that was all CAA first team in 2016. If the Great Danes can get 2016-level production, they may be able to control the ground and win more games than anticipated. Fearless Prediction: Albany will play a lot of close, low scoring games, never scoring more than 27 points in any contest; but come out wrong side of the score and wind up 5-6 for the season.